Easter comes early this year: March 31, 2013. A long time ago it was decided to set the date of Easter as the first Sunday following the first full moon after the vernal equinox (or the first day of spring). The decision was a long and complicated one, but a key factor was this: since Jesus rose from the dead and appeared to his disciples on a Sunday, then Easter should be on a Sunday. Other proposals had it so Easter could fall on any day of the week. The church, in its wisdom, decided instead to have Easter fall every year on Sunday. In a real sense, every Sunday is a little Easter. But Easter is such a profound holy day on the church’s calendar that our spiritual ancestors decided to preface it with a season of preparation marked by prayer, fasting, and spiritual reflection. So the season of Lent was created to make the transition from more ordinary time to the day of resurrection. Ash Wednesday means different things to different people, I suppose, but at a very basic level the ritual we gather and perform is designed to remind us that we are not immortal, that these bodies we coddle, clothe, decorate, protect, nurture, feed, and insure will go the way of the earth. The first man (Hebrew, Adam) was made of the dust (Hebrew, Adamah). The Adam came from the Adamah. That is what we are. That is who we are. On my best day. On my worst day. I am dust, and on another day not of my choosing I will return to the dust. But we are citizens of heaven, exiles on earth awaiting eagerly for a Liberator, our Lord Jesus the Anointed, to come and transform these humble, earthly [read . . . dust] bodies into the form of His glorious body by the same power that brings all things under His control. All of us dust-men and dust-women down here on earth really belong to another kingdom. Right now, we wait, hope, and long for the world to come. It is our true home. When the resurrected Jesus returns, resurrection will become our reality just as it is for Jesus. On that day we will exchange these mortal bodies for glorious ones. 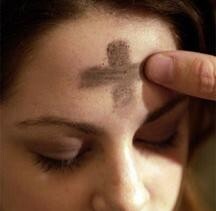 Ash Wednesday and Easter are two sides of an important, very human, deeply spiritual reality. By David B. Capes in Uncategorized on February 13, 2013 . A beautiful reflection. Thank you.